About the Nine Spiritual Bodies of Ancient Egypt « CONSTABLE RESEARCH B.V. 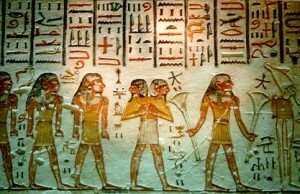 The last examples of ancient Egyptian Hieroglyphs date from 450 AD. After that time the Egyptian script and language was replaced with the Coptic script and the Coptic language until it was replaced by the Arabic language in the 11th century. From that time on nobody was able to understand the Hieroglyphs. At this moment a complete new interpretation of the Hieroglyphs is emerging showing Egypt as a highly technical advanced culture. When scientists started to interpret the hieroglyphs they believed the hieroglyphs were nothing more than primitive picture writing. Much later they discovered that the hieroglyphic script is Phonetic just like our own language. The Pictures represent an Alphabet. The Puzzle of the Alphabet of the hieroglyphs was solved by Jean-François Champollion who had a profound knowledge of the old Coptic language still used in the Coptic Church. When the Egyptian Alphabet was finally deciphered the scientists could read the texts but they had no idea what the texts meant. To understand the language they used a theory. Just like the theory of the primitive pictorial language they supposed that the Egyptian Texts were written by Primitive Pagans to describe Religious Rituals. The Scientists translated the texts literally just like the current translation software is doing. Linguistics, the scientific study of natural language, has evolved a lot since the first scientists started to translate the hieroglyphs. We now know that the deep structure of languages is related to almost Universal Metaphors. Texts always contain a Hidden Meaning. The knowledge of the old Cultures of the East is greatly advanced since the time of Champollion (1832). We now know much more about ancient Egyptian Mathematics and Physics and our knowledge of Mathematics and Physics has also greatly advanced. This makes it possible to see and understand things we were not able to See 150 years ago. Scranton and Harvey have developed a completely different and controversial interpretation of the Hieroglyphs. They are convinced that most of the Ancient Texts are not about Rituals but about Physical Practises based on Advanced Knowledge of the Physical Universe. Scranton researched the Symbols of the Dogon in West Africa. The Dogon Culture is just like the Coptic Language still existent and it was possible to interview one of the Shaman and ask him to explain their symbols. This interview took place around 1930 but the researchers Griaule and Dieterlen documented the interviews very well. They showed that the Symbols of the Dogon and the Symbols of the old Egyptians were highly comparable. Scranton, a computer expert, analyzed the Symbols and found a striking resemblance with current String Theory. Clesson Harvey has discovered a new way to translate the Pyramid Texts. The Pyramid Texts are the oldest known “religious” texts in the world. They date between 2400-2300 BC. According to Harvey the Pyramid Texts have nothing to do with religion. He believes the Pyramid Texts are a Technical Manual to Operate a very Powerful Machine. The conclusions of Harvey and Scranton are the same. The Egyptians were using highly advanced knowledge about the Physics of the Universe. This knowledge was used to build powerfull machines that were controlled with the Mind. 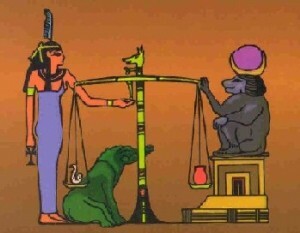 Egyptian Theory is based on Cycles. The Old Scientists knew that every Thing in the Physical Universe is governed by Cycles. This is the principle of Ma’at. They knew that the one of the most important cycles is the Cycle of Precession. This Cycle takes 25,771.5 years. Every time when the Signs of the Zodiac moved in the Sky the Egyptian Religion was adjusted to the new Sign (Taurus, Ram, Pisces, Aquarius …). They also knew that the Pole Star moved with the Precession. At this moment the Pole Star is in Polaris. Clesson Harvey discovered that the Pyramid Texts are focused on Polaris which means that the Knowledge of the Pyramid Texts is at least 25.772,5 years old. 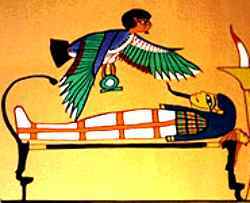 The Egyptians were aware of the Spiritual Bodies of the Human Being. This knowledge is still not accepted in Mainstream Psychology. Mainstream Psychologists call everything that is outside their Theory, ab-normal or Para-Normal. Some Psychologists Accept the Para-Normal and are trying to explain Phenomena like Out of the Body Experiences and Near-Death Experiences. When they do this they often make use of theories that were created in China, India and Egypt a long time ago. These old theories show a remarkable resemblance. The Egyptians knew that the Universe was a Self-Referential Structure, a Fractal. They knew that one principle repeats itself on every Level. The Structure of the Universe is repeated in the Human Body and the Human Cells. If the Universe is a Nine-Fold pattern, the Spiritual Body also has to be a Nine-Fold Pattern. 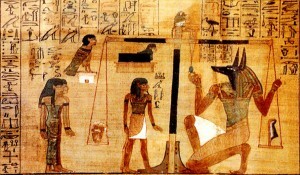 The Nine Bodies were named Ren (the Name of the Body, the Chemical Structure, the Strong Force), Ab (the Heart, the Center, the Consciousness, The Center of Gravity), Akh (Shiner, The Luminous Body, the Force of Decay, Radiation, the Weak Force), Khaibit (Shadow, Aura, the Electro Magnetic Field of the Body), Ka, Ba , Khat, Sahu and Sekhem. A person’s Ren (his DNA, his Blueprint, Date/Time & Place of Birth) was given to them at birth and would live for as long as that name was spoken. A cartouche (a magical rope) was often used to surround the name and protect it for eternity. The knowledge of the True Name could destroy a man. If somebody knew the Date/Time and Place of a Person he could find out with the Use of Astrology everything he wanted to know. It was also believed that if a man knew the name of a god or a demon, and addressed him by it, he was bound to answer him and to do whatever he wished. The Scientists still don’t understand the concepts of Ka, Ba, Khat and Sekhem. The Sahu is an InterStellar Space-Ship steered by the Soul (Ba). It accompanies the human being in its endless cycle of birth, death, transformation, and rebirth. The Sahu contains the Projected Personalities (Ren) in the Matrix, the Memories (Akasha), the spiritual Aims and Purposes of every Incarnation of the Soul in every part of the Multi-Verse. If we understand the Nine-Fold Pattern it is not so difficult to map the first four Spiritual Bodies (Ren, Ab, Akh, Khaibit) to the Four Forces or Four Elements of our Physical Universe. The next five Bodies are very different. 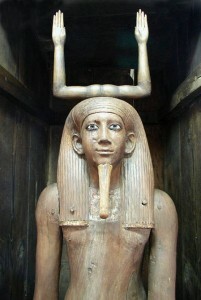 They are related to the Egyptian Underworld governed by Osiris. The Egyptian Underworld is a representation of our Seven Twin Universes associated with what the current scientists call Dark Matter. The Ka (Dark Matter Chemical Body), the Ba, (Dark Matter Heart, The Center, Conscioussness, Soul), the Khat (Dark Matter Etheric Body) and the Sahu (Dark Matter Light Body) exist in a different Space/Time. The Twin Universes are only reachable by the Portal of the Sekhem, the Singularity, the Primal Void, the Hole in Time. The “Dark Matter” Bodies can be controlled when the Chemical Body (Ego, Personality, Ka) and Consciousness (Ab, the Heart) merge. At that moment they are able to use the Supra-Celestial Body, the Sahu, the Vessel. The Portal of Sekhem is only open during a short period of time at a special place on the Earth Grid. This moment appears when we move from the Sign of the Fishes to the Sign of Aquarius (NOW!). When we want to operate the Time-Machine we have to Breath in our Sahu, the indestructible Container of the Human Soul, our Light Body. To use our Sahu we have to Clean Ourselves (Live from the Heart, Ab), Meditate (Becoming the Observer) and Practice the Breathing Techniques of the Old Scientists. According to Clesson Harvey we are living in a very special Time/Space. It is the Time/Space that opens up the possibility to use the Tremendous Power behind the Dark Matter. This power makes it possible to play with the Laws of Gravity. We are able to lift Heavy Masses (Telekinesis). We are also able to move to another Time/Space in the Multi-Universe (The Underworld). The only thing that is still missing to operate the Machine, is a Magic Crystal, the Stone of Destiny, the BnBn-Stone. One of the (many) theories is that this Crystal was stolen out of the Pyramid by Moses during the Reign of Pharao Akhenaton, put into the Arc of the Convenant, moved to Chartres by the Knights Templars, taken over by the Cathars and finally put into a Secret Cave close to Lourdes. This entry was posted on Saturday, August 1st, 2009 at 4:37 pm	and is filed under Completed, History. You can follow any responses to this entry through the RSS 2.0 feed. You can leave a response, or trackback from your own site.